In the center of downtown Santa Fe is a green plaza – the square. A row of merchants lines up in the northeast side of the plaza at the Palace of the Governors. But these aren’t just any merchants. Authentic Native American jewelry artisans set up and sell their silver jewelry in Santa Fe every day. Big silver cuffs cast from sandstone, elaborate crescent necklaces, and glittering silver rings inlaid with turquoise and onyx line the row. The Palace of the Governors is hands-down the best place to buy jewelry in Santa Fe. You know the jewelry is authentic Native American, because the merchants have to meet rigid qualifications to sell their work. Also, there’s just so much variety to explore at Palace of the Governors. You’ll find much more jewelry here than if you walked into any one store. Not to mention, you can meet the artist who made the piece in person. One of my favorite things to do is buy a unique piece of jewelry at every place I travel to, and I love to speak with the person who made it. It makes a story for the piece. The merchants know how to sell their jewelry, too! Be prepared for some lively conversation that makes it harder to walk away from a cool design. I had planned on just one lovely new piece, but ended up walking away with a few more! Not only is it so personable to speak with the artists, but markets like this usually offer better prices than you’ll find in a shop. And you’ll find more than just women’s jewelry, too! Men can pick up the coolest bolo ties, embellished pocket knives, cuff links, and rings of their own. The challenge in shopping for jewelry in Santa Fe is to find something that can also be worn in an urban city like Houston. Big Southwestern stones can be overwhelming to wear every day, and my style is a bit more understated. I ended up with a few more pieces than I planned to buy, but it will probably be a while before I visit Santa Fe again and they are all classic pieces of jewelry. Love these studs inlaid with turquoise, black onyx, jade, and mother of pearl. This big silver cuff with no stone has a modern treatment to a Southwestern silhouette. This spiral turquoise ring should attract friendship. And these beautiful spiral twist earrings were made by a creative and spunky lady. Plenty of websites online offer authentic Native American jewelry if that’s what you’re looking for. 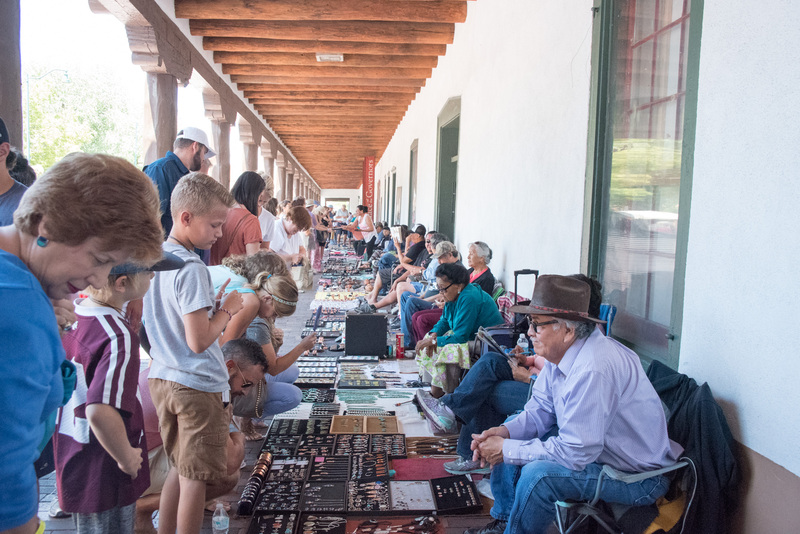 You can check out Silver Tribe, Native American Jewelry, All Tribes, Pueblo Direct, Palms Trading Co, Eagle Rock Trading Post and more. But nothing beats visiting the market yourself, trying on the pieces, and chatting with the artists to find jewelry in Santa Fe.